In September, silver formed an essential low around the USD 14 mark. After that, it was moving only the sideways at a low level for the next month. Followed by an interim rally, this low was tested again in November. Silver, however, successfully defended this critical mark. Hence, the precious metal showed a rally, which was marked by a robust bullish breakout above the USD 14.90 marks. The dynamic with the breakout above the mark of USD 14.90 took place as a sign of strength in the market. 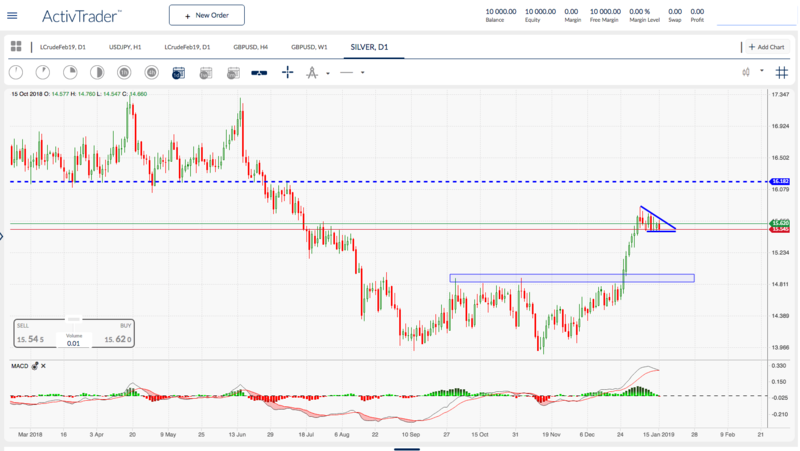 This strength can allow further price potential up to the last resistance level of around 16.20 USD. A pullback to the USD 15.20 range is possible. The MACD indicator shows a tendency to turn in. A turning MACD indicator would speak for the pullback scenario. However, the range of USD 15.20 should then offer support to the market. Simultaneously, the pullback opens the option to enter the market. If the market falls below USD 15.20, the situation worsens, and another scenario ought to be thought of. If there is no pullback, there is a possibility that a bullish flag will develop. A further buy signal will be generated if the USD 15.85 mark is broken.